We are pleased to announce that our non tobacco flavored line of disposable electronic cigarettes is back! We have brought only the best and favorite flavors back! Enjoy our ripe and succulently sweet cherry flavor with each vape. With a flavor that tastes this good it will make grown men cry over their sweet cherry pie. 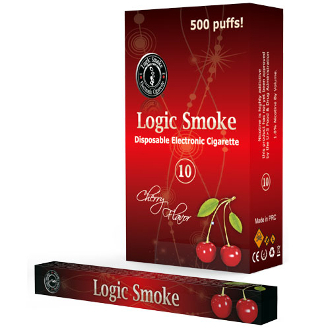 This top of the line Soft Tip Disposable electronic cigarettes from Logic Smoke has the newest technology. Made up of a cartomizer filled with the best e-liquid and a lithium ion battery; this comes completely charged and ready to go. There is no maintenance involved at all with this disposable e-cigarette. Just open, remove the sticker from the vent hole and start puffing. Its soft tip gives added feelings of smoking a regular cigarette and it is light weight and comfortable to hold and use. Our NEWLY redesigned Disposable Electronic Cigarettes boasts enhanced flavors and a soft tip to give the feel of smoking a regular cigarette. This makes your vaping experience all the more pleasure filled and satisfying.